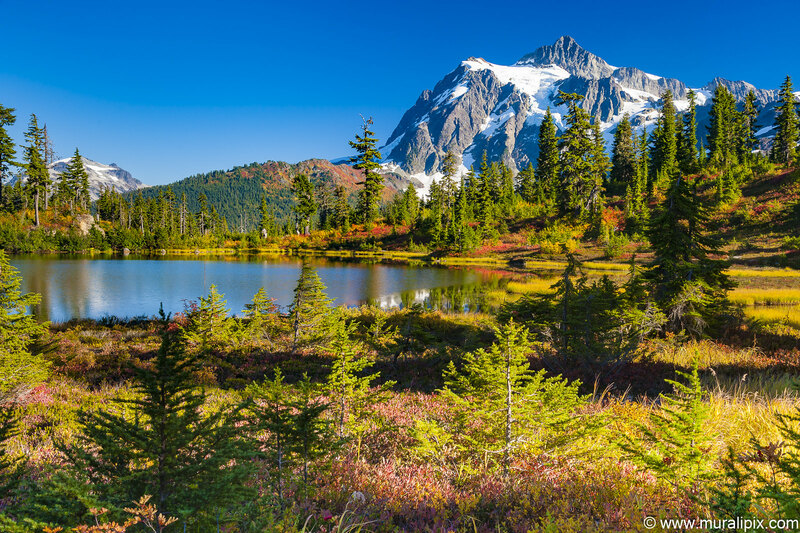 Although the area is renowned for winter activities such as skiing and snowshoeing, I consider early to mid October to be one of the best times to visit the Mt. Baker Ski area which is about 135 miles (3 hrs by car) north of Seattle, WA. 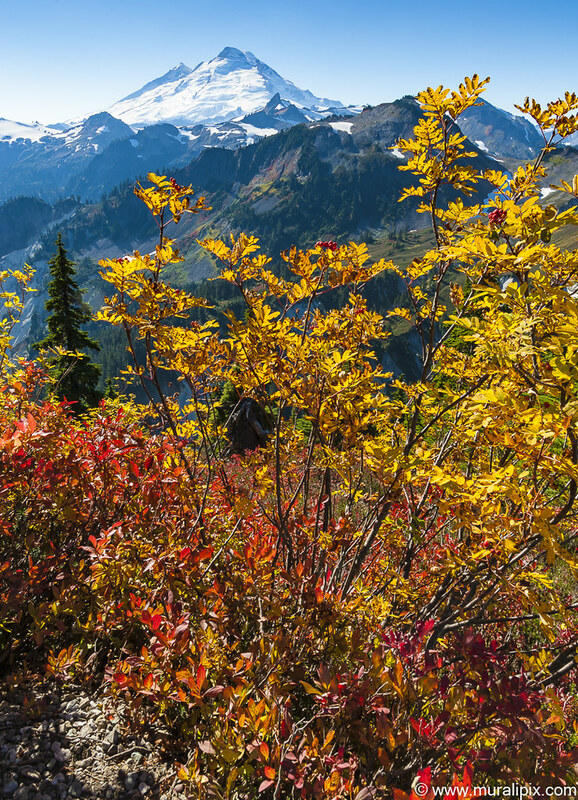 The fall colors are at their peak and the Artist Point hike and others are fantastic. 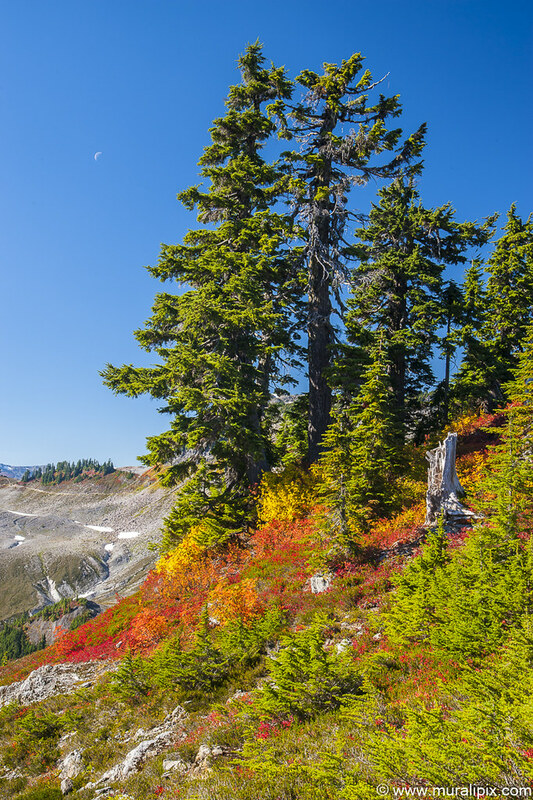 In 2012, my friend, Chris Mullins, and I took a day trip to photograph the fall colors around Mt. Baker and Mt. Shuksan. We left Redmond at around 8am and after a quick lunch in Bellingham, we reached the Artist Point trailhead just after Noon. 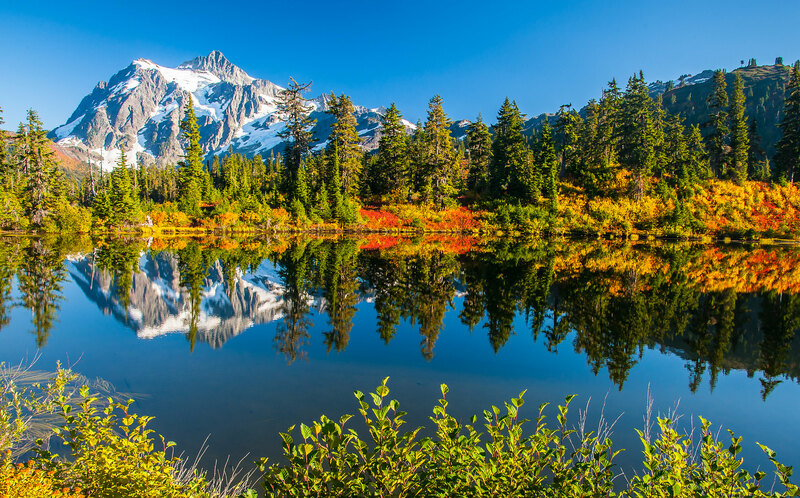 Artist Point is located at the very end of Mount Baker Highway, State Route 542 and boasts 360-degree views of Mount Shuksan and Mount Baker, as well as access to a variety of trails. 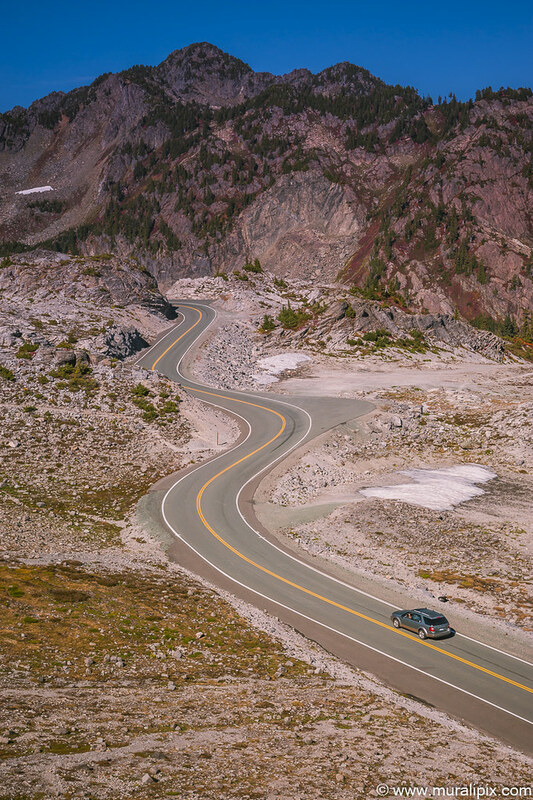 The road to Artist Point, 2.7 miles long (milepost 54.55 to 57.26) and more than 5,000 feet above sea level, is typically buried under snow and closed October through June. It typically opens in July and remains open until the first substantial snowfall of the year, which usually comes in early to mid October. The weather was terrific and the huckleberry and blueberry bushes were at their peak red color. As we climbed higher, I shot an image of the road leading up to the trailhead from the Mt. Baker ski area. 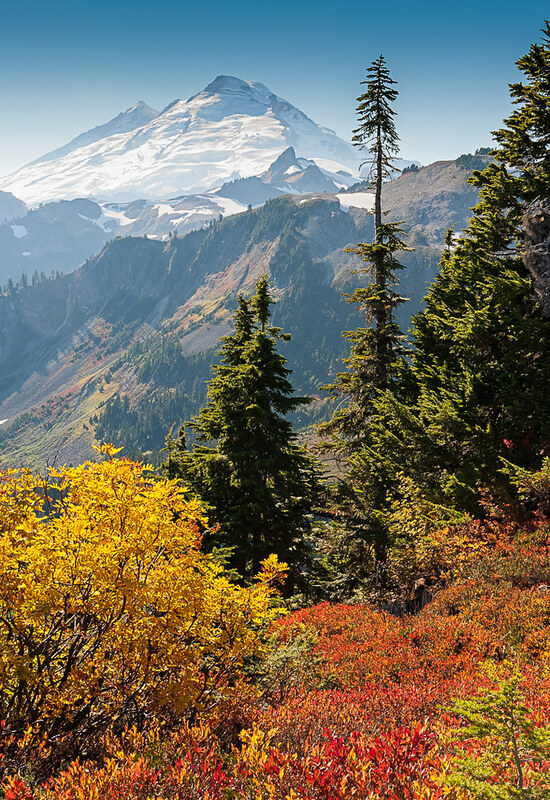 The following three images were captured while hiking the Artist Point trail. Tip: Morning is a better time to photograph Mt. Baker but to accomplish that you either need to sleep overnight near there or start driving from Seattle at 4am. As the mountain is west of the trail, expect a little bit of backlighting in the afternoon. After hiking for about 2.5 hrs, we got back into Chris’s BMW convertible and went to Picture Lake/Highwood Lake next to the ski area. Both are perfect spots to photograph Mt. Shuksan reflections. 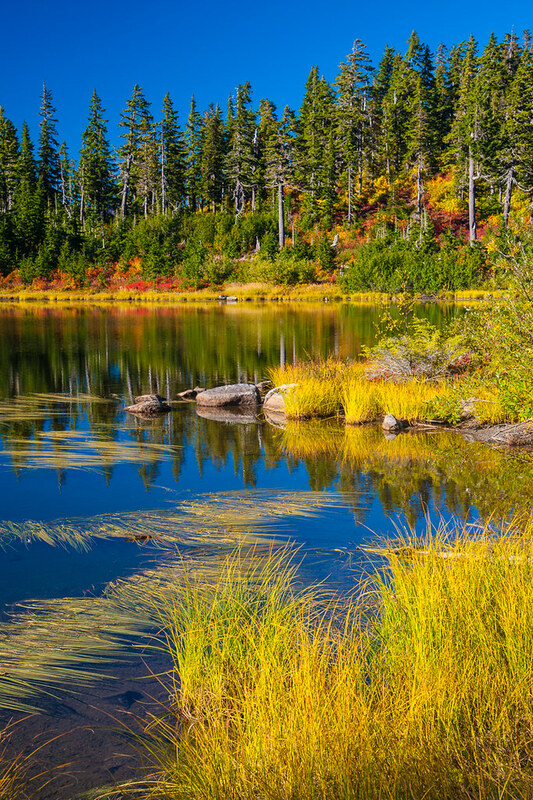 In early October, the fall foliage around both lakes add a lot of color to the scenery. You will need patience for the water to be still to capture good reflections. I have seen photographers use polarizing filters to bring out the saturation of fall colors but I prefer a higher shutter speed to crisply capture the reflections. YMMV. Here are three images, first & second shot at Picture Lake and the third captured at Highwood Lake. As the sunset was not impressive, we drove back home.